Welcome to the Freeola Internet customer support pages. This guide is designed to help with setting up your Philips Router to work with Freeola Broadband via a No-NAT connection. For more internet help topics please visit our main Support Page. If you are looking for general ADSL router configuration please visit our General Router Settings help guide. For a standard NAT enabled Philips setup guide please click here. These instructions apply to Philips routers. The settings may also apply to other routers using the same or similar routers. On the computer connected to the router, load your internet web browser and visit the following internet address: http://192.168.2.1. 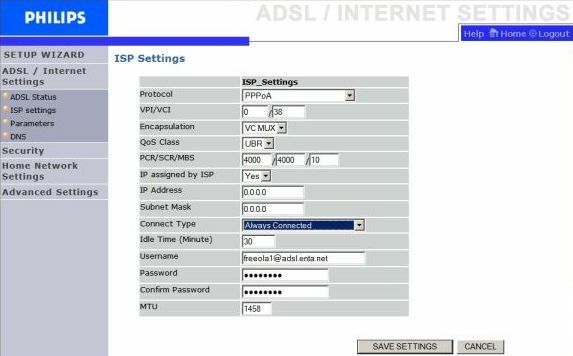 Select the option ADSL/Internet Settings from the left hand side menu, now select ISP Settings and you should see a screen similar to the one below. Select other as the ISP name, then make sure that Protocol is set to PPPoA , make sure that VPI/VCI is set to 0/38 respectively and change Connect Type to Always Connected. Enter your Username and Password as shown in your MyFreeola account or as supplied to you by Freeola Support. This should be in the format:[email protected] for Family and Business Broadband packages, or [email protected] ﻿for Unlimited Broadband﻿.﻿ Change the MTU to 1458 and then click the Save Settings button. The router should now restart, once this has completed you will have to log into the router again. Select the Security option from the left hand side menu, and then select Firewall. Select the Disable radio button, and then click Save Settings, again the router will restart. Now select Home Network Settings from the left hand menu. You should disable your DHCP server by selecting the Disabled radio button. Now enter the IP address you will have been given for the router (this is the second address in the range provided), although we will usually specifically tell you the address to use for the router). You will get a message asking you to manually change the address in the address bar, click this button. You will now need to change the IP address of the computer that you are using so that it is able to see the router. In order to do this, go to the Windows Control Panel, and select Network Connections, right click on Local Area Connection (or your wireless connection) and select Properties. Click on Internet Protocol (TCP/IP) and then select Properties. A window similar to the one below will appear. Make sure that Use the following IP address is selected and enter in the IP address you want to use, this would usually be the next IP address in the range you have been assigned. For example if you have been given 10.195.195.52 as the start of the range you can use any IP Address from 10.195.195.53 to 10.195.195.56. In the Subnet Mask enter 255.255.255.248. Enter in the Default gateway, this would be the same IP address as you entered on the router earlier. 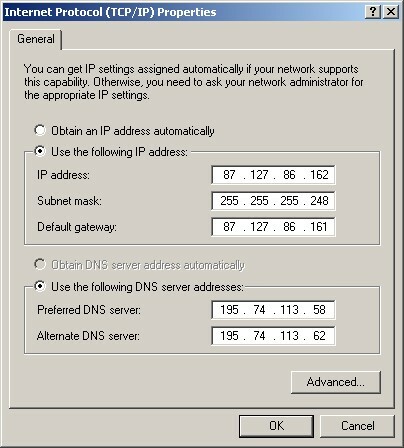 Make sure that Use the following DNS server address is selected and enter 195.74.113.58 and 195.74.113.62﻿ in the Preferred and Alternate DNS server fields. Click on OK and then OK on the properties dialog to save these changes and close this window. Now enter the router IP address in the Address bar of your browser and press return. The Web browser should then load with the Philips Router Configuration page. Your router should now be connected to the internet. Go to Tools on the top menu, click System Commands and then click Save All. To finish click Log Out on the left. You will need to repeat these steps for any other machines you want to give a IP address to (using a unique IP address from the range given to you). Please advise why you are suggesting an MTU setting of 1458 when 1500 is quoted in another knowledge base article? Either MTU setting will be valid for a Freeola connection. However, some routers and connections will work better with the lower MTU, which is why this setting may alternate between guides.